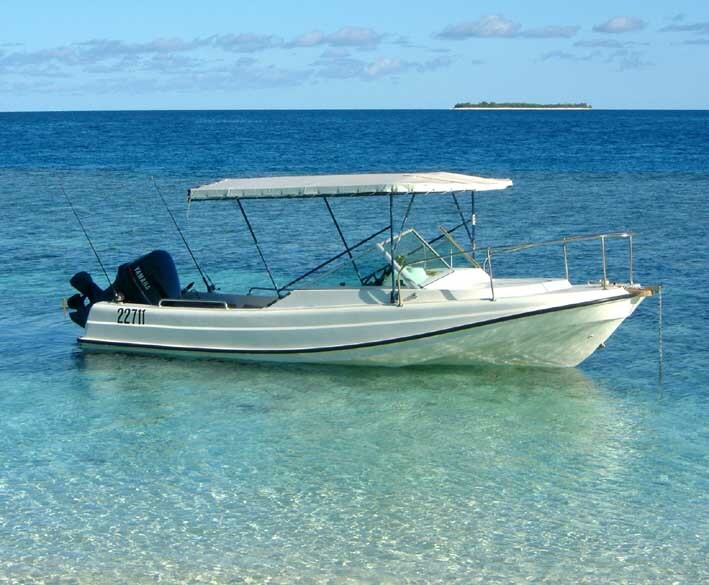 While Boston Whaler boats have been top-sellers in the United States for decades, they are also popular with overseas buyers. Here is a brief collection of some Whalers seen on several continents. "I had the pleasure of vacationing in Italy this summer, where I spent some time on the Riviera, including a town of stunning beauty, Portofino. This jewel of a city has long been the summer playground for the world's super-rich. It is difficult to access except by water, and has a naturally perfect harbor. A photo of the harbor taken from the hillside is attached. "As a Whaler aficionado, I was pleasantly surprised to see a tremendous number of Whalers in use, virtually all of which were classics. Beautifully-maintained Whalers were to be seen everywhere on the Riviera, and they appeared to be the tender of choice among yacht owners. 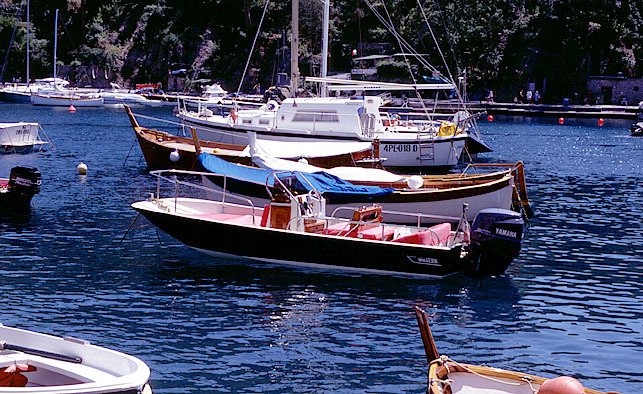 "Moored in Portofino harbor among the yachts, super yachts, classic wood Rivas, and 100+ foot sailboats, I found two Whalers that were truly unique. Photos are attached. Their hulls are black, their bottoms are white, and their upholstery is covered in what appears to be a removable pink fabric. That combination may sound strange, but after viewing them I think you'll agree that the overall effect is attractive. "The super yacht that appears in the background in one of the Black Whaler photos is called "Sole Mates". It's registered in the Cayman Islands. I'd like to know who owns it, but so far I haven't been able to obtain that information. If your readers have any suggestions as to how to determine its ownership, I'd appreciate hearing from them. "Hope you like these photos. Your site is excellent. I don't currently own a Whaler, but I'm planning to purchase a classic in the near future, preferably a Revenge or an Outrage." The normally Desert Tan gelcoat of this Whaler has been redone in black for a striking change in the hull color. A modern Yamaha four-stroke engine on the transom provides quiet and clean propulsion. Another view of this Whaler with a black hull. Note the mega-yacht behind it. "Hi, my name is Marco Damian, I'm from Monza (Milan) Italy. 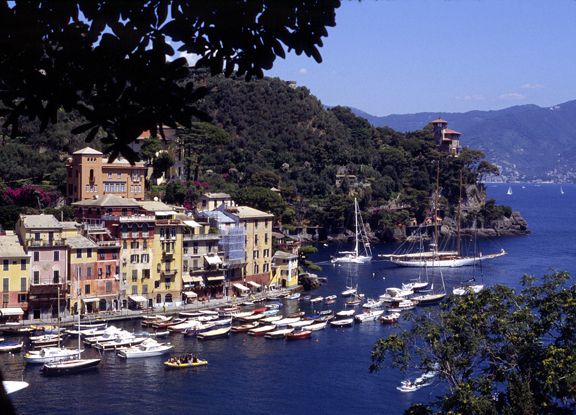 "My photo was taken during last summer in Portofino. My boat was built in the seventies, the engine is a Yamaha 25-HP with electric starter. I don't know much about the history of this boat that I've bought last year. During this winter I've undertaken a complete restoration of the hull and next winter i'll take care of the rest of the boat (wood, hardware, etc). 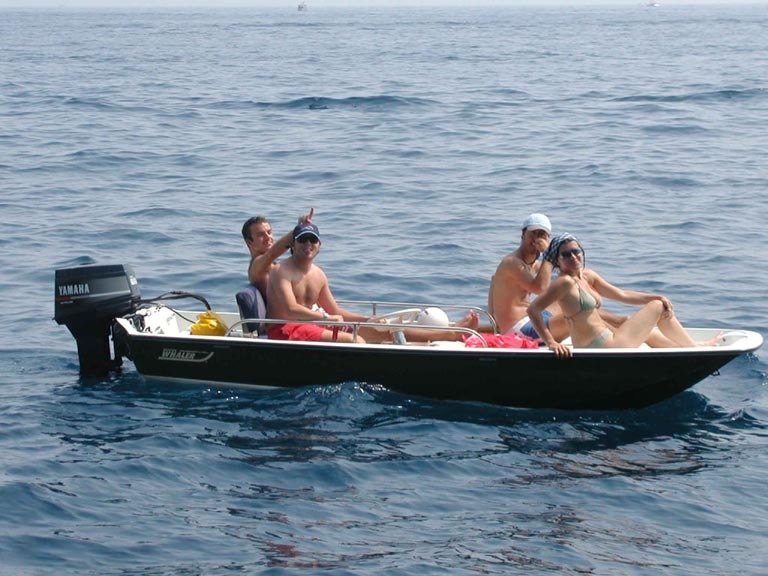 "The boat is currently in Santa Margherita Ligure (Genova), but I wish I could bring it to the Como Lake to go fishing. "The Hull was originally white with a blue interior. I had it repainted green (very dark indeed!) with cream interior last winter. 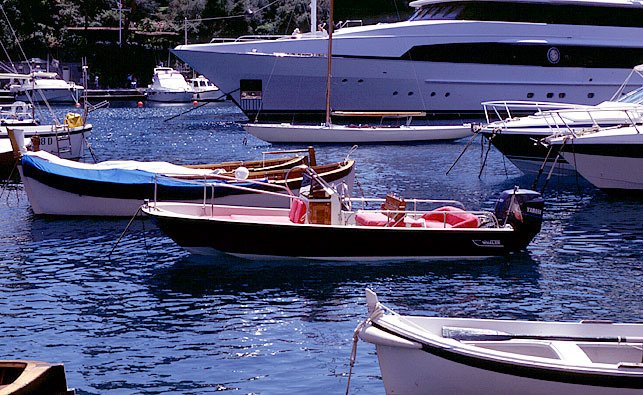 It's very fashionable here in Tigullio (the gulf in front of Portofino) to repaint Whalers in various colours. I've seen a lot of dark blue hull Whalers and also red, yellow and orange ones. There is a lot of these amazing boats right here, as they are very practical to get around since there are very few beaches. "I wish I could send you better pictures of my Whaler and other Italian ones as soon as possible." Enjoying some fine Mediteranian weather in this unique 15-Sport are Marco (at the helm), Riccardo on his left, and Giorgio and Vittoria forward. "I took delivery of a new model 170-Montauk on the 1st of July and have basically nothing but praise for it, although a few comments. First of all I find the tanks delivered as standard are really ridiculous. Come on, 2 X 25-liter tanks is a too limited endurance for a four stroke Yamaha 80 BHP. Would you have, at this early stage of this new Montauks life, an idea of what to install instead and how to do it. (See the Reference section article on fuel tanks.) I have read all the earlier articles for the old model Montauk on your site. "Secondly I can not understand why Boston Whaler couldn't have holders for a boat hook, fishing rods etc., installed from the factory. Sometimes I find BW to be too basic! "Thirdly I have to confirm the better sea capability of this new model of Montauk. I had earlier the Outrage 18 (1990 model). To keep a straight course at lower speed is very easy compared to the 18-Outrage. All in all, this far, a new Whaler to be strongly recommended. Enclosing a picture of Montauk 170 "OLGA" being launched late at the first of July 2002. I would like to thank you for the very interesting site of yours." The new 170-Montauk has already reached European buyers, albeit minus the manditory Mercury outboard. 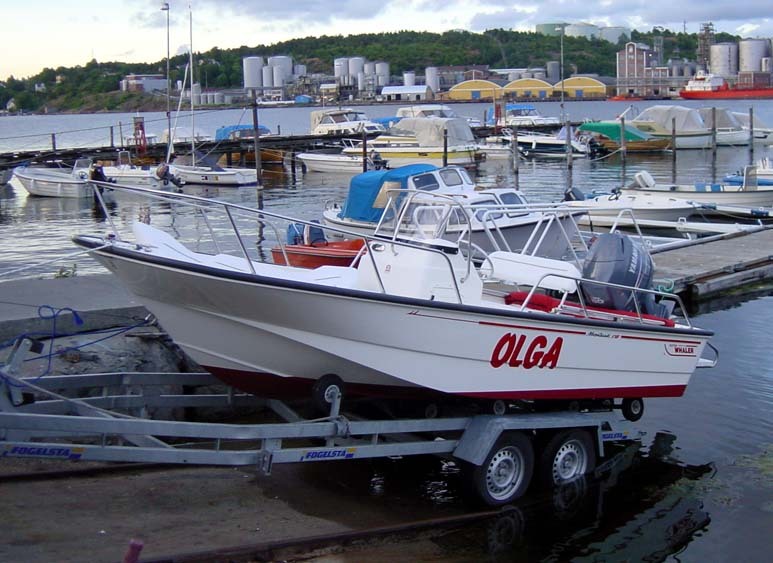 Here OLGA is about to slide into Norwegian water from an unusual roller-trailer. Note the 80-HP Yamaha 4-stroke on the stern. "I want you to know that I'm a big fan of the Boston Whaler products and your Classic Whaler web site. "I'm living in The Netherlands, Europe. I include with this mail two photos of my 1991 30th Anniversary Montauk with 1999 90 2-stroke Mercury. I do not know the history of my boat, only that the previous owner bought it in 1997 and put the 1999 Mercury on it. I bought it last year August. One of the previous owners took of the bleu 30th Anniversary striping. "It is a standard boat with not much accessories on it. 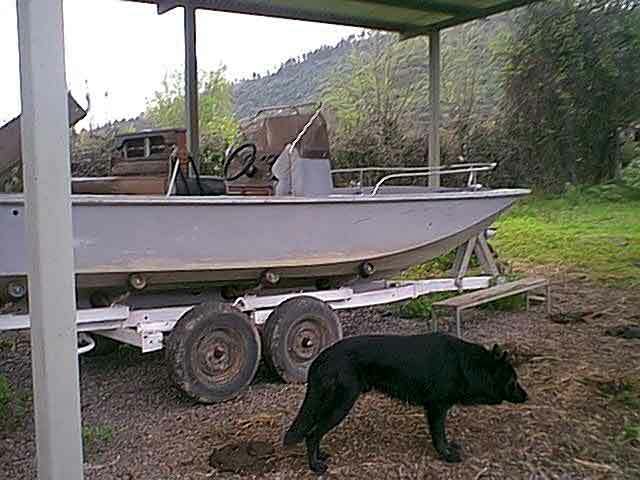 It has a heavy-duty rub-rail and I put a Raython L365 fish-finder on it this year. I changed the two metal Quicksilver 6 gallon tanks for one plastic Tempo 19 gallon tank. My family and me are use the boat for cruising. We live in the south of The Netherlands. 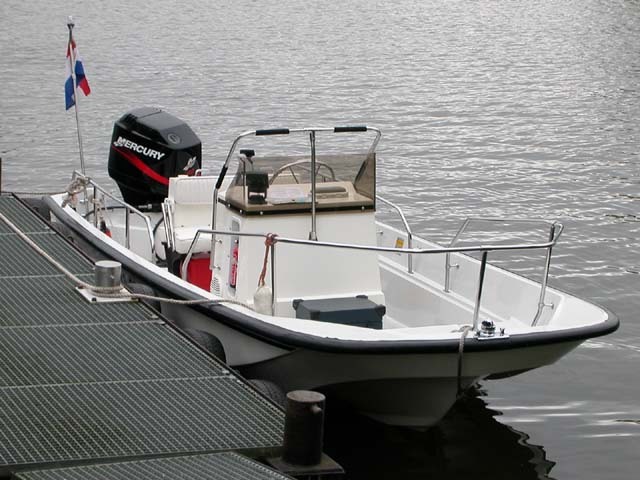 We use the boat in the spring and summer period during from April to the end of September. 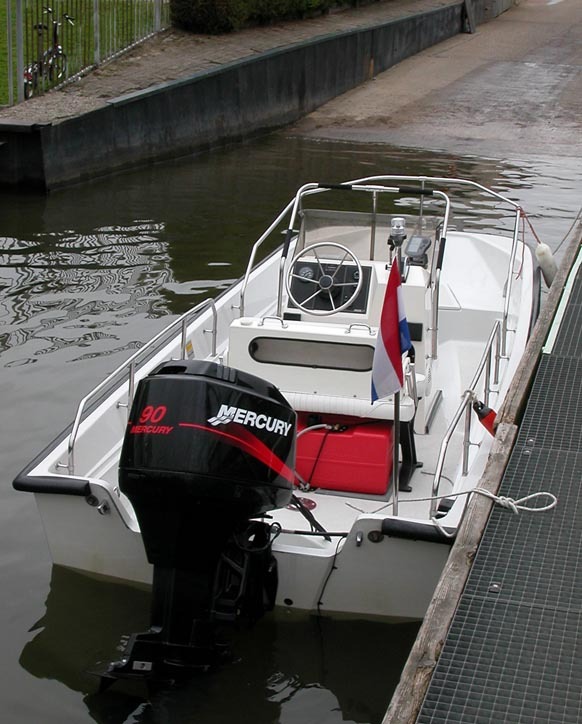 We trailer the boat to the ramp of 'Lage Zwaluwe' where we start our trips. We go into the National park 'De Biesbosch' or in the direction of the North Sea over 'Het Hollands Diep' and 'Haringvliet'. "The two pictures were made on one of my last trips in September with my new Nikon digital camera. At the trips I was the only one on board, so no family is included. On both pictures is the Dutch registration not visible but the Dutch flag is. "My boat and set-up is not the most spectacular but maybe a nice addition on page 65. "I wish you all the success with the Continuous Wave web site (portal)." This very nice and super clean 17-Montauk was originally a 30th Anniversary model. This dock is in the National Park De Biesbosch. It looks like a very nice facility! And the Montauk looks to be in perfect condition, as well. At the launching ramp in Lage Zwaluwe, The Netherlands. Another very attractive boating facility, and a very attractive Whaler. "This is my boat. I am keeping it in Morocco Venezuela. This is a part of the gulf coast. It is my first boat ever and I am enjoying it very much. We fish, ski, and cruise most weekends. I have a family, a boy 5 years old, a girl, and another boy, 2 years old." 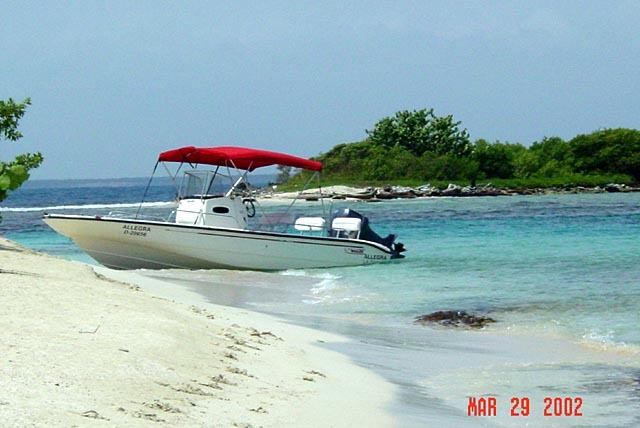 This beautiful beach setting complements the nice lines of the Whaler 22-Dauntless, seen here near Morocco, Veneuzuela. Fishing and cruising are favorite weekend activities for Alonso and family. "I reached there looking for info on Boston Whaler and found a lot of fine reference. Thanks. "Here I send you a picture of a Boston Whaler I found in Lago Rapel (Rapel lake) in Chile. I cannot find the HIN yet but still working on it thanks to your reference info. I was told it was built in 1990-- any comment after seeing picture? "It has no motor and my sole concern is which will be min and max HP to power it." 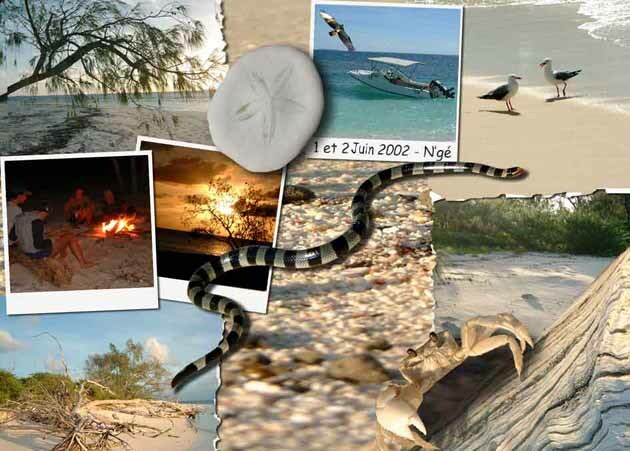 "I got some photos from New Caledonia (French Island) in South Pacifique for you! That's a very old 21-Whaler (1975 ?) completely refurbished in 2000. 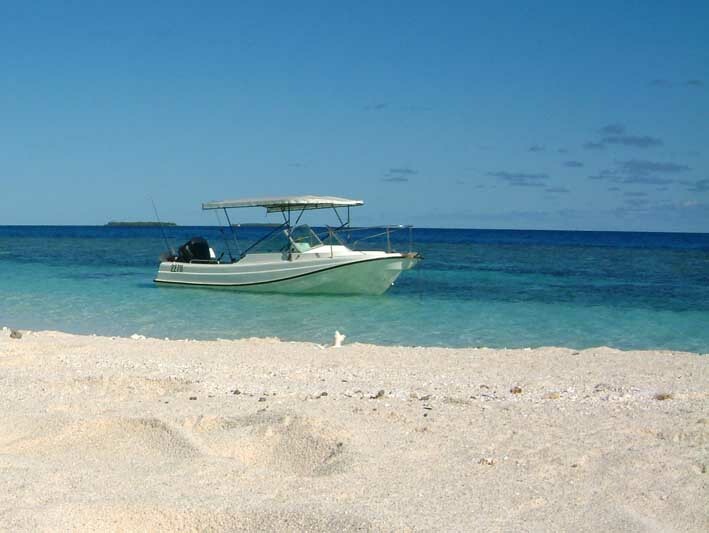 We leave our city NOUMEA two times each month to get to N'Ge, a very little island on the barrier reef. The trip is two hours long (65 km). The Yamaha 200 drinks 45 to 50 liters at 40 to 45 Km/hour to get there. "You have done a really excellent job on web! Merci beaucoup!" This well preserved 21-REVENGE is anchored off a beautiful beach in the South Pacific. And I thought the water in Lake Michigan was blue! The 21-REVENGE was built on the 21-foot Outrage hull, but featured a very small cuddy cabin, dual console with side helm, and a walk-through windshield. The precise age of this model is not known but it appears to be in great shape. Those deck curves are classical. Eric's skills are not limited to boat restoration. He created this beautiful montage of scenes from his cruise. The page has been accessed 70139 times.